Also, there’s a bartender here with an Acid Bath T-Shirt on. Top man. First Fragment are one of those bands that I always assumed I’d never get to see live. I’m glad I was mistaken. From the very first opening instrumental the band’s technical prowess is evident as they shred and blast their way through complex songs with skilled prowess. There’s a decent crowd for an opening band, and although there’s not really a whole lot of movement from people during the band’s set, if looks a if this is because most of them are simply here to watch the musicians do their musiciany things; they’re certainly appreciative enough between songs. I enjoy how much the band are so obviously into what they are playing; there is some quality gurning tonight. Despite the less than perfect sound, (but one that’s still quite serviceable), the band’s enthusiasm is clearly undampened. A new song is aired, (named Soif Brulante, I believe), indicating that the band’s high quality levels don’t seem to have slipped at all since Dasein. I look forward to hearing more new material in the future. Although the band’s insane complexity and technicality suffered from an uneven sound, it’s still a solid and entertaining opening slot from First Fragment. I really like Allegaeon’s last album Proponent for Sentience and wish I knew more of their material. It doesn’t seem to matter too much, however, as tonight’s set may consist of more songs that I don’t know than of those that I do, but it’s still a great experience. Opening with All Hail Science the band sound like a physical wall of heaviness and aggression. It’s quite the opening statement. 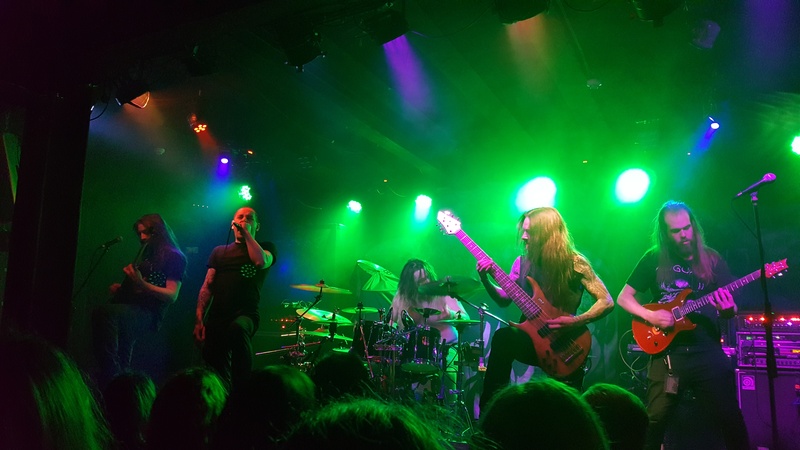 With a thicker, heavier sound than that of First Fragment, Allegaeon tear through their songs with an obvious enthusiasm that can’t help but get the crowd moving too. The singer’s roars are very well performed and he knows how to work the crowd. The entire band are on fire tonight, in fact. Even though I don’t know the next song – Gravimetric Time Dilation – its simple thunderous opening section gets the blood pumping. After the dizzying complexity of First Fragment, it’s a welcome change of pace to have something more direct and straightforward. Not that Allegaeon are without technicality of their own, of course, but they’re definitely a different beast. Allegaeon also offer up a new song tonight – Stellar Tidal Disruption. It’s melodic, (in places), brutal, (in places), fast, (throughout), and follows on nicely from the music on Proponent for Sentience. It also has a section with clean vocals, although unfortunately these are inaudible for some reason. The next song sees the evening’s first circle/mosh pit open up on the vocalist’s demand too. The final song closes their set strong, and Allegaeon seem to have made many people happy tonight. Considering the fact that I know Allegaeon the least out of the four bands on the bill tonight, they’ve really impressed. I’ve always been curious as to how Fallujah’s complex and layered sound would translate live, and now I know. After some atmospheric mood setting they burst out of the stage like an earthquake sped up about 1000 times. The sheer brutality of Carved from Stone is staggering. The band’s new singer has an instantly charismatic and strong presence, and his screams are serrated and potent. He handles the band’s older material well, and definitely seems to have easily stamped his own personality over them. He pretty much dominates the stage from the start to the end. Fallujah’s dream-like ethereal atmospherics are subdued compared to their album counterparts, down to a uneven sound more than anything, but it’s hard to be too disappointed due to the sheer aggression that comes off the band in waves. 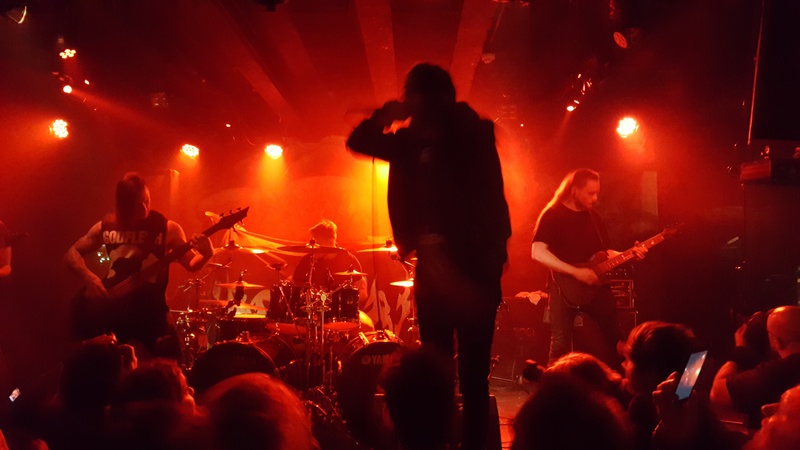 I’ve never seen Fallujah live before, so I might be wrong, but they give the impression of a band rejuvenated and refreshed. Obviously I have nothing to compare it to, but that’s the impression I get nonetheless. The singer’s powerful performance and the amount of venom he puts into his vocals seem to be infecting the rest of the band in a very positive way. The sound may be muddy, but the band’s passion is not. They play songs that are mainly taken from Dreamless, but with a couple of cuts from The Flesh Prevails too. Those, and a brand new song as well. This new material seems even more aggressive and focused than ever, at least on first impression in a live setting. Any fears about the band disappearing into a watered down progressive metal rabbit hole appear to be unfounded. The sound does clear up as the set progresses, and more and more nuance and atmosphere creep in. 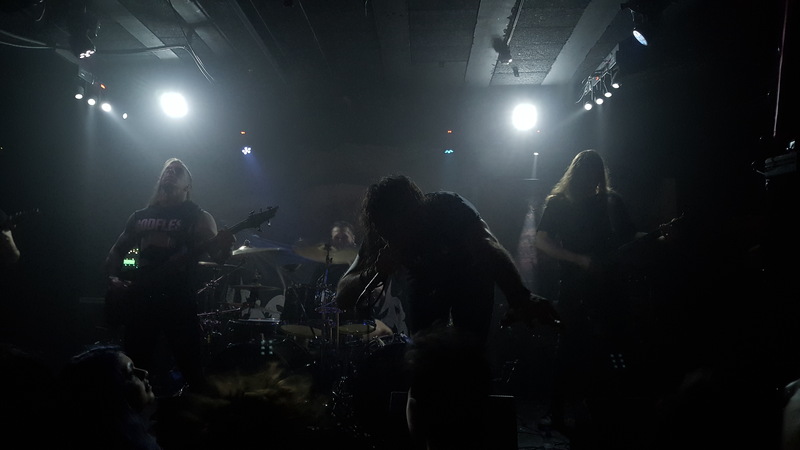 None of the band’s power is lost, however; the opposite in fact, a Fallujah increasingly just sound even more like themselves, albeit with a vocalist that screams more than growls. Compared to Allegaeon’s set, most of the crowd seem surprisingly subdued. Maybe they’re intimidated by the tangible waves of atmospheric intensity and brutal aggression radiating from the stage? Who knows. Regardless, Fallujah have put on quite the spectacle as far as I’m concerned. 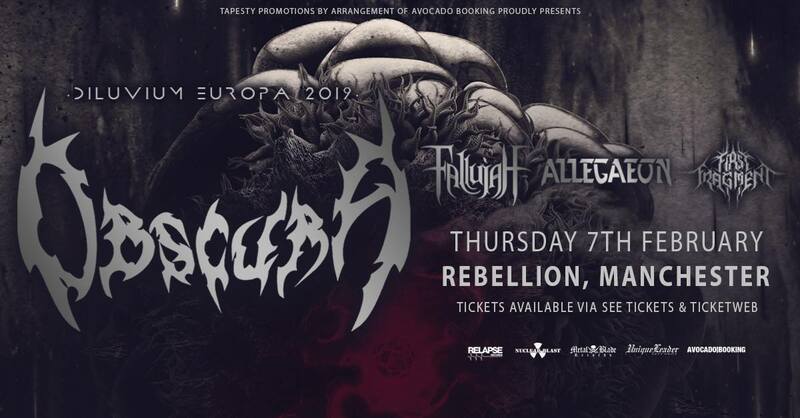 If Fallujah manage to capture the raw intensity of their live show on their upcoming album, it’s sure to be a stunner. Touring on the back of Diluvium – an album that I keep enjoying more and more every time I listen to it – tonight’s headliners are clearly highly anticipated by the crowd. 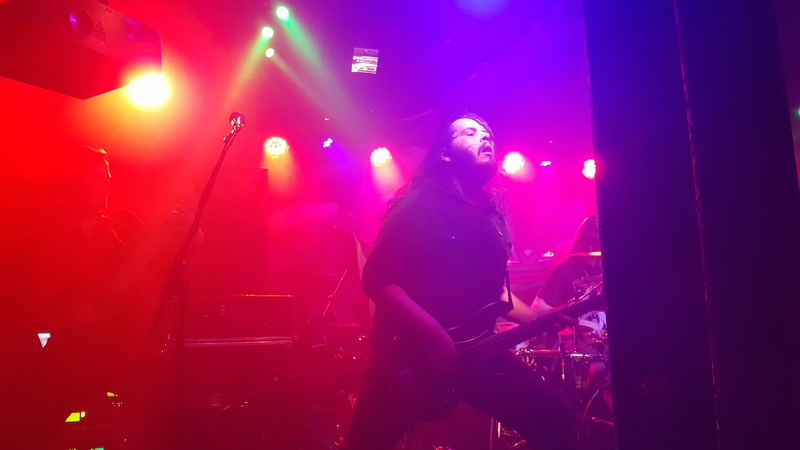 Carefully balancing technicality with songcraft, Obscura act like the consummate professionals that they are tonight, and their set is enjoyably well-oiled and efficient. It’s also very effective. Amidst the crunchy riffs and liquid solos the band seem to be enjoying themselves, and the same seems to be true of the crowd. Prior to the title track of Akróasis, the band’s frontman introduces the rest of Obscura, which is not something I’ve witnessed a band do for quite some time. 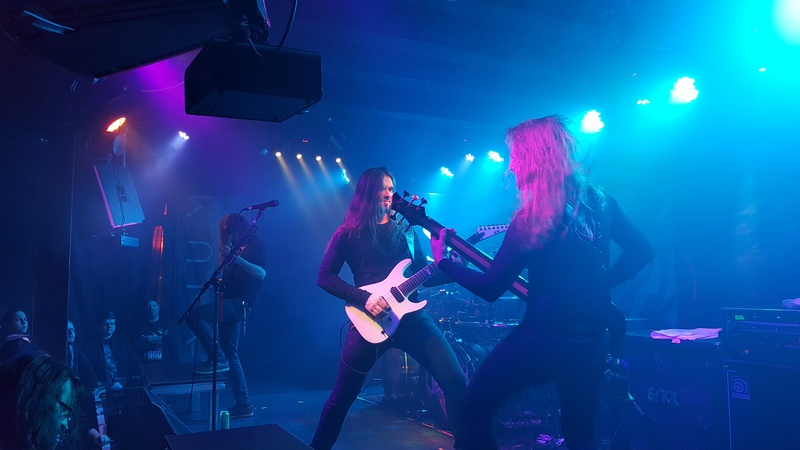 Combined with the rampant throwing of horns and the occasional Steve Harris-isms of the bassist, there’s a curiously old-school feeling to tonight’s show in places. This is not a bad thing at all. There’s lots of fretless bass shenanigans and molten guitar solos to be had tonight, as well as plenty of gripping riffs and progressive wandering. 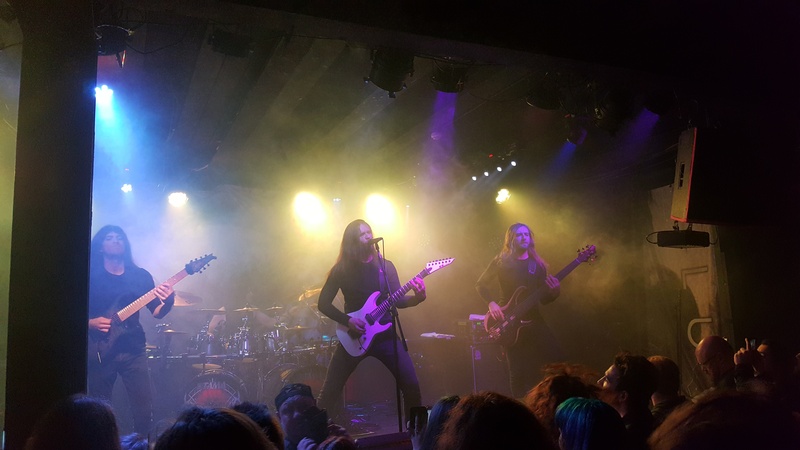 Obscura’s set list tonight ranges across four of their albums, and a strong selection of tracks it is. I’m especially pleased they play the title track of their latest album, as that’s a particular favourite of mine. Septuagint is damn good too, although I could really just say that about any song they play. Incarnated off Cosmogenesis is notable as it finally prompts the first circle/mosh pit of Obscura’s set. The fake last song of the evening, (An Epilogue to Infinity), sounds particularly immense, and the real last song, (The Anticosmic Overload), even more so. Obscura end on a high note. An outro tape plays, and people seem satisfied. 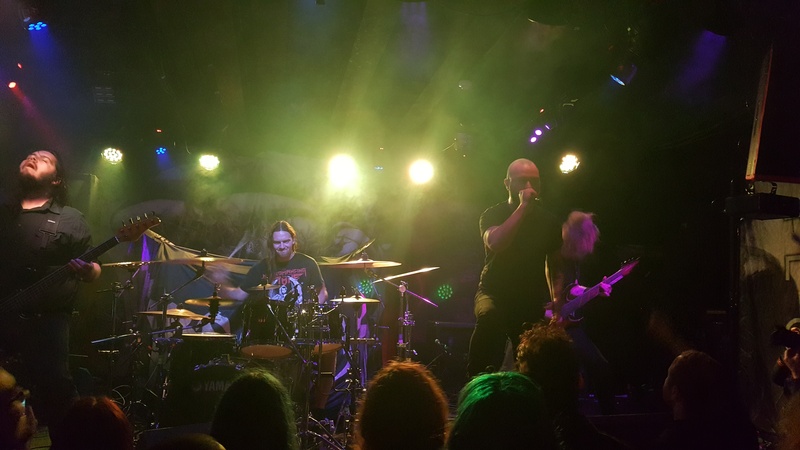 Professional and extremely enjoyable, it’s a great end to an evening of quality and quite varied extreme metal. 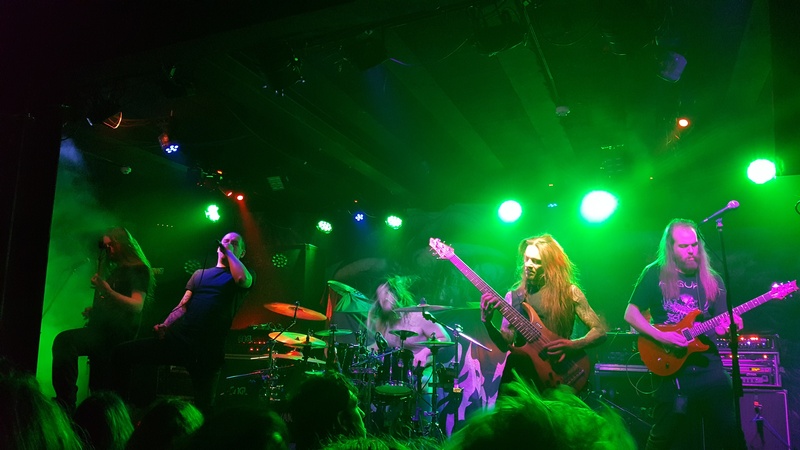 This entry was posted in Live Reviews and tagged Allegaeon, Death Metal, Extreme metal, Fallujah, First Fragment, Metal, Obscura, Progressive Death Metal, Technical death metal. Bookmark the permalink.